This is quite a story before us this morning. As I considered the direction this sermon should take, it seemed I had three possible choices. 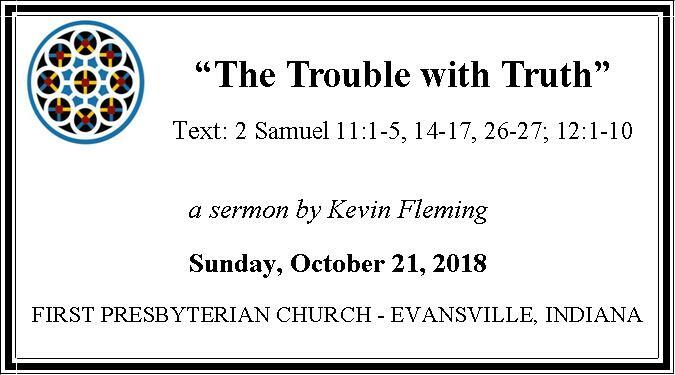 First, the sermon could focus on David, the imperfect leader, the lecherous adulterer, the coward who sent his armies into the field “in the spring of the year, the time when kings go out to battle,” while choosing to stay at home. David, the cur, who sent a brave man to his death in order to have his wife as David’s own. David the profligate, who, by the grace of God, became more than his monument to sin, and gained an unequaled place in the eyes of his people. David always provides a good sermon. Then, we could consider the lot of Bathsheba. Unlike David, Bathsheba is where she is supposed to be, doing what she is supposed to do. She is ogled by David the peeping-Tom and, in his kingly power, send guards to bring her to him. David impregnates Bathsheba in that abuse of power that is always at the heart of all sexual abuse. David, by royal order, has Bathsheba’s husband, Uriah, killed in battle in an attempt to cover up his conspiracy - a play, which, by the way, seldom works. And, before we know it, Bathsheba no longer has a name - she is simply “the wife of Uriah” and she and her pain and her part of the story completely disappear. David is always good for a few sermons. Bathsheba is reminiscent of the story we had a couple of weeks back about Moses and “Koo-Koo-Ka-Choo Mrs. Potiphar.” So, maybe that angle is a little too fresh to repeat, though God’s people must never be slow to condemn those who sexually abuse others and assist both victims and abusers to return to the fullness of life God intends for all people. So, that leaves us with one other possibility. That possibility - and frankly, the one I could not escape - is the prophet Nathan. Nathan is a prophet. Being a prophet means, not that you are a fortune-teller, or a predictor of the future, but a spokesperson for God. When God wants to speak to people, one of the ways God accomplishes that is through the work of a prophet. And God has something to say to David. So, Nathan is sent. Our lesson is a bit cryptic in why God is sending Nathan. We are simply told, “But the thing that David had done displeased the Lord.” The question is, “what thing?” Was David’s behavior with Bathsheba “the thing?” Strangely, it doesn’t appear to be. What seems to be at the heart of God’s displeasure is the loss of Uriah’s life and his wife. Not only has David broken the covenant by committing murder and committing adultery, he has also broken the unique relationship that God established with David. God’s displeasure with David is an echo of that part of the story of Noah and the Flood, where God says that he is sorry that he ever created humankind in the first place. God is disappointed in David and God’s heart is heavy. For that reason, God sends Nathan to the King. Rather than simply confronting David with his wrongdoing, Nathan uses a parable to speak to the king. The parable is a study in contrasts - a rich man and a poor man - one who had everything and one who had next to nothing. When the opportunity presented itself, the rich man took the only thing that the poor man had and used it for his own benefit. As Nathan spun the tale, David’s anger grew. David found himself drawn into the story. His anger burned. He was furious at the rich man of Nathan’s story and passed judgment on him. “As the Lord lives, the man who has done this deserves to die!” He doesn’t see the parallels between the story and his own actions. David is oblivious to the fact that he is the rich man of Nathan’s tale. In the fullness of his kingly power, he condemns the rich man. At that moment, Nathan says to the king, “You are the man!” David, by his own words, has condemned himself. The fullness of his rejection of God’s way begins to set in. He is burdened with guilt. David feels the estrangement from God that always comes to those who abandon God’s way. David’s willingness to use violence to achieve his desired ends will be part of his family’s story. David will always find himself in some sort of conflict. David will never completely shake off this part of his narrative. But, what of Nathan? How hard must it have been to stand before the king and speak truth? How frightened Nathan might have been to convict the most powerful man in his world of his sin and faults and failures? What risk did Nathan run in speaking truth to power? It almost makes you wonder where are the Nathans of today. Instead of preachers and prophets who speak God’s truth to power, we see the abandonment of God’s will and way for a few moments of glory and a slight sip from the cup of power. Instead of crying out against the abuses of power that are rampant, we see those who cuddle up and coddle those who commit such sin against God that it makes you wonder if God is paying attention. Rather than decrying injustice, the abuse of the poor, the condoning of murder, the pillaging of the earth and its resources, the continuing of bloodshed on battlefields, rampant racism, and the politics of division, the preachers and prophets of today instead choose to speak of prosperity, caring for yourself, and amassing trophies and other evidences of success. These pusillanimous preachers and prophets are not speaking truth to power, because the trouble with truth is that it tends to upset people and when you are trying to curry favor with the powerful, it’s hard to proclaim the truth that points out their faults and failings. It’s hard to speak God’s truth into a place and a situation and into a life where that truth is neither cherished nor respected, so, rather than upset anyone, or risk being ignored by those to whom you desperately want to be endeared, you silence God’s word and condone the abandonment of God’s way. Sometimes facing up to God’s truths means going against what the majority says and believes. Sometimes owning God’s truth means that life goes in a direction you could not have anticipated. Sometimes embracing God’s truth means putting yourself at odds with people around you - powerful or not. Sometimes you just have to face up the fact the the truth often comes with some trouble. But, here’s the thing: Nathan went to King David at God’s command, not to condemn David, but to turn him around. Nathan went to David, not as the judge, jury, and executioner, but as the messenger of God’s grace. God could have allowed David to believe that he had gotten away with his grievous behavior, but instead chose to send Nathan to open the door to David’s restoration and salvation. Sometimes we are sent into the trials and troubles of this world to bring a moment of awareness that can lead to redemption and restoration. Sometimes we are called to speak truth into a situation where lies and falsehood have pride of place. Sometimes we are challenged to go against the grain of the world and stand as God’s people. And sometimes - maybe even more often than we are aware - we are called and commissioned to be messengers of God’s grace and channels of God’s restoring love. The trouble with truth is that it is can frighten both the person who bears the truth and the person who needs to hear it. But, as always - God is with us. For now and evermore. Amen.